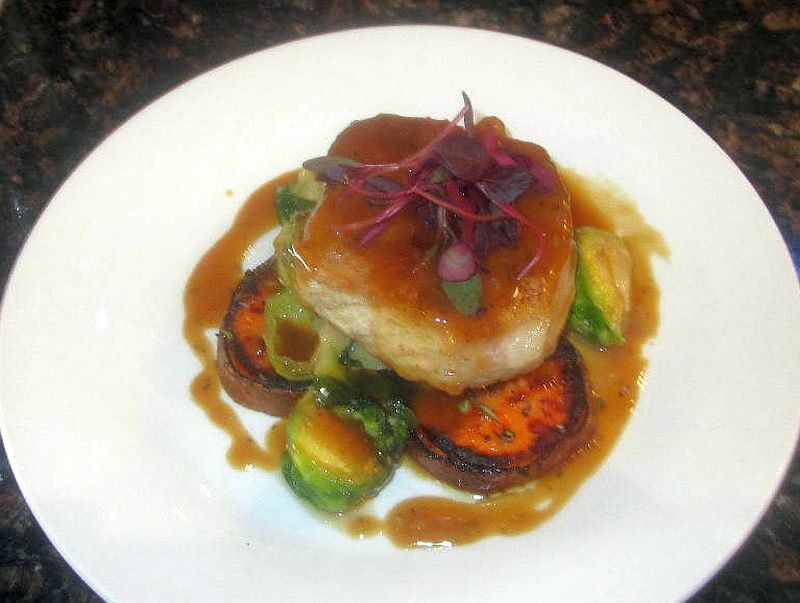 2013 was a good year for outstanding dishes in Albuquerque and in New Mexico. I have put together a list of my favorites. They are in random order. 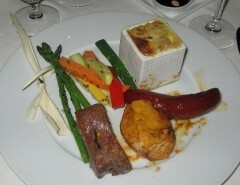 Notice that four of the dishes are from several restaurants at the Hyatt Regency Tamaya Resort on the Santa Ana Pueblo. I urge you to try these places, especially Corn Maiden, which I find spectacular. Near the center of this panorama are the Rio Grande Lounge (eat and drink on the patio) and the Corn Maiden, one of the most outstanding restaurants in New Mexico. The view of the Sandia Mountain from the patio is spectacular. My friend Gil Garduño, New Mexico’ sesquipedalian sybaritr, has compiled a review of culinary and other significant events for 2013. He leaves few stones unturned. You need to read this. 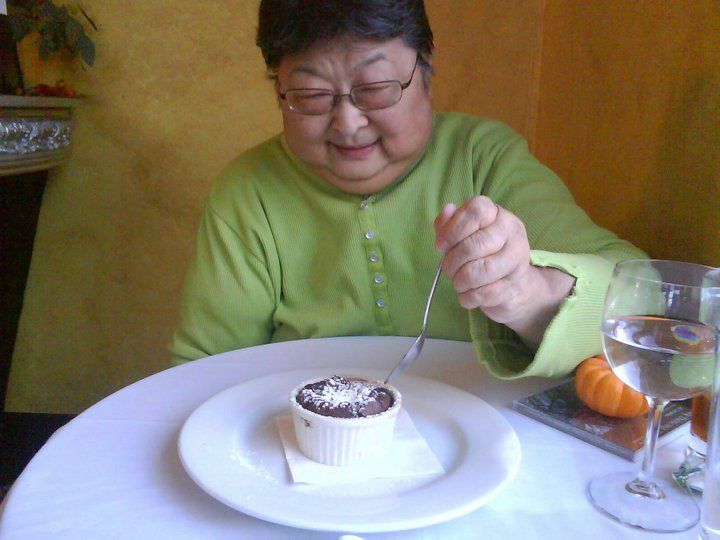 On a sad note, my friend Mina Yamashita passed on recently. 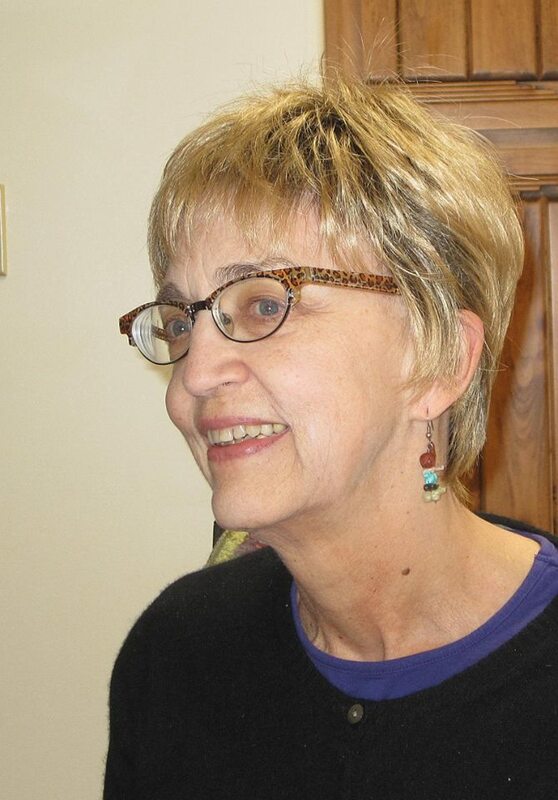 Mina was a delightful and warm person and her writings were as elegant as her tastes. I miss her. I miss her dearly. But her spirit often visits me, often while I am in restaurants with tears falling into my food. Menudo Rojo, among the very best I have had. Menudo is a traditional Mexican soup made with beef stomach (tripe) in a clear broth or with a red chile base. 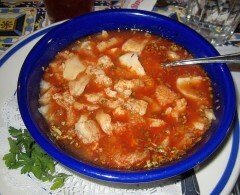 Usually, lime, chopped onions, and chopped cilantro are added, as well as crushed oregano and crushed red chile peppers. The version served here is just short ob being incendiary (the way I like it), and is served with Sopaipillas, which are very good. Preparing menudo can be somewhat tricky. If the tripe is not cleaned and cooked properly, the result can vary between tough (chewy) or slimy and overdone. This tripe is the very best that I have encountered, and the whole dish is as perfect as I could expect. This is corn Maiden’s signature dish, and I cannot think of a way to make it any better. The chorizo casing has that perfect pop, and the spicy, juicy interior explodes onto the palate. Best rotisserie meal I have encountered anyplace. The white cube contains a delicious version of scalloped potatos with green chile. 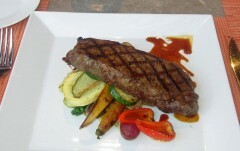 NM Heritage Grilled Strip Loin Steak with bourbon and molasses glaze, roasted fingerling potatoes, leeks. Perfectly cooked to a juicy medium rare, this excellent piece of grass-fed beef melts in your mouth. The bourbon and molasses glaze makes this one of the very best steaks I have had anywhere. 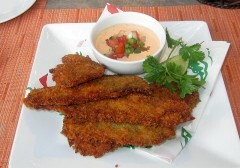 So you thought you knew every way that Hatch chiles can be served? Well, this is new to me. Deftly breaded and lightly fried, the medium piquancy of the chiles leaves a hot and smoky aftertaste. Not a hint of oil, these morsels are perfect. I could easily make a meal of these. 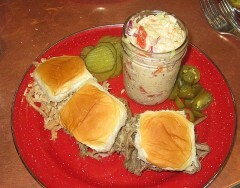 With Red Chile Cole Slaw. Order all three varieties and experiment with the sauces. These sliders are worth a big rave. We Nuevo Mejicanos are accustomed to having Carne Adovada slow cooked in red chile, but this pita was filled with pork, baby field greens, mozzarella cheese, and a juicy mayo-based sauce and expertly grilled on the press until the cheese hit that just melted liquid state. 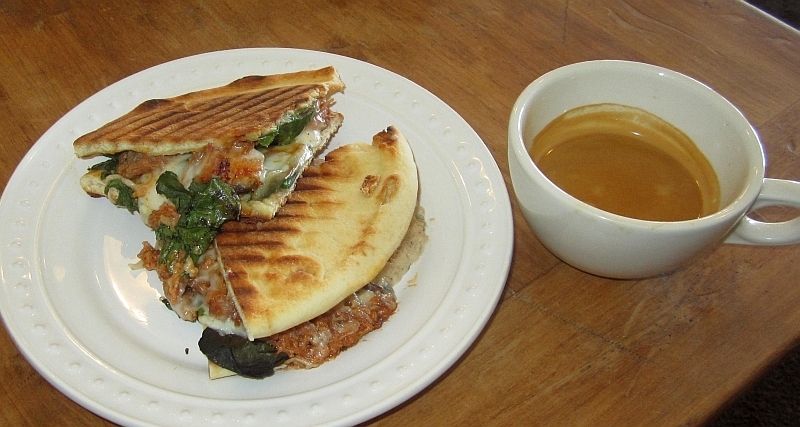 This is by no means a dry sandwich, but five paper napkin sloppy. The fillings exploded onto my taste buds. Best panini I have ever had. Anyplace. Michael also brewed up a Cuban-like coffee drink for me: Two shots of his special espresso with some granulated cane sugar were put in the extractor basket, and the resulting beverage is among the very best I have ever had. Anyplace. Great lunch. Stuffed with bread, ricotta, guanciale, onion and garlic, served with pomodoro and grated pecorino Romano. The stuffing is intensely rich and complex. The calamari are cooked to a tender perfection. 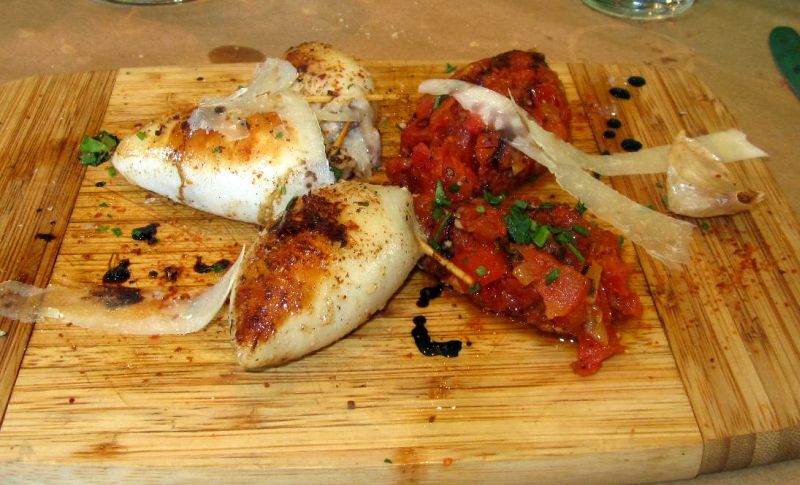 The roasted pomidoro have a dense texture, and are a perfect accompaniment to the calamari. The acidity of the tomatos plays nicely against the sweet richness of the ricotta-based stuffing. This is a superb dish. Maxime has done it again. 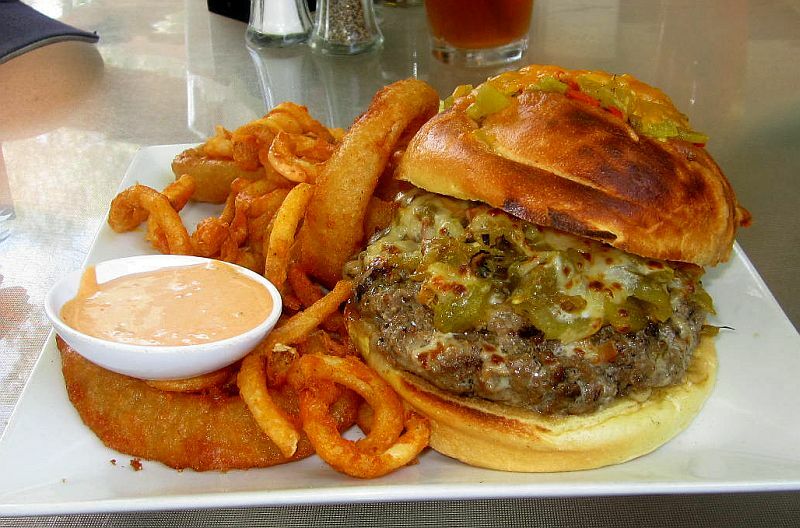 You won’t find a simple GCCB on the lunch menu — There is a Hobo Burger loaded with the kitchen sink, including Portabello. I am a GCCB purist, and while the Hobo is surely excellent, it would be difficult to compare this with all the other GCCBs for my GCCB Hall of Fame list. I have twice special ordered the GCCB competition style (meat, cheese, green chile all on a lightly toasted bun with no other trimmings or silly things like mayo, catsup, or mustard). Both times the kitchen built one perfectly, exactly to my order. Medium rare with extra napkins to mop the juice from my cheeks. Phenomenal. The meat is hand-cut, hand-ground, hand-formed and lovingly cooked Black Angus. Tender, juicy, and among the best tasting burgers that I have had anywhere. The green is Hatch, natch, and is about 7 / 10 on my piquancy scale, and it has that required smoky flavor. Order it with curly fries and onion rings, both of which are beautifully done. Very tasty with no hint of grease. Get a little dish of the excellent Red Chile Aioli for dipping. Real Nuevo Mejicanos have no use for catsup or the like, deeming such condiments tools of the devil. 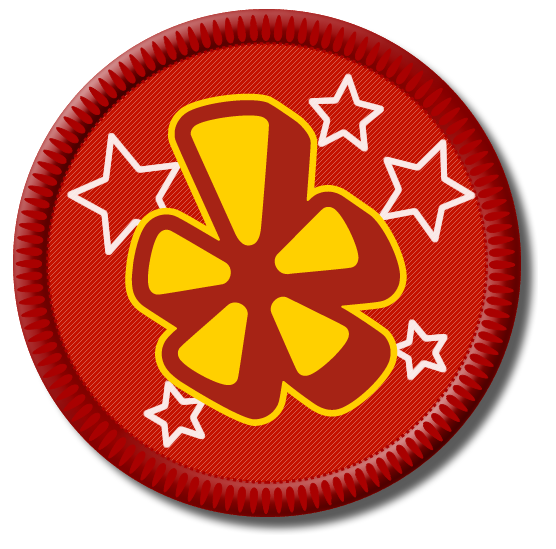 This GCCB has rocketed its way to #6 on my GCCB Hall of Fame. It’s that good. 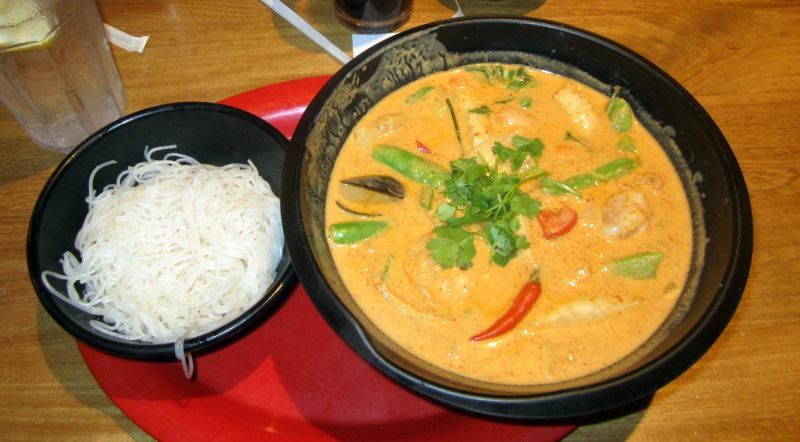 I ordered this curry with seafood (shrimp, mussels, clams, and whatever else was on hand) and noodles (rice vermicelli). It comes with peas in the pod. I asked for it extra hot, and that’s what I got. Notice the red chiles floating atop the curry). Mix the noodles into the broth, stir them up, and get down to it. The first taste sent my taste buds on a trip to heaven. This is a complex dish that explodes on the palate. The version here is richer in flavor than any other that I have ever had. The shrimp was perfectly cooked and incredibly tasty. I would come back here every week for just this dish. It’s that good. 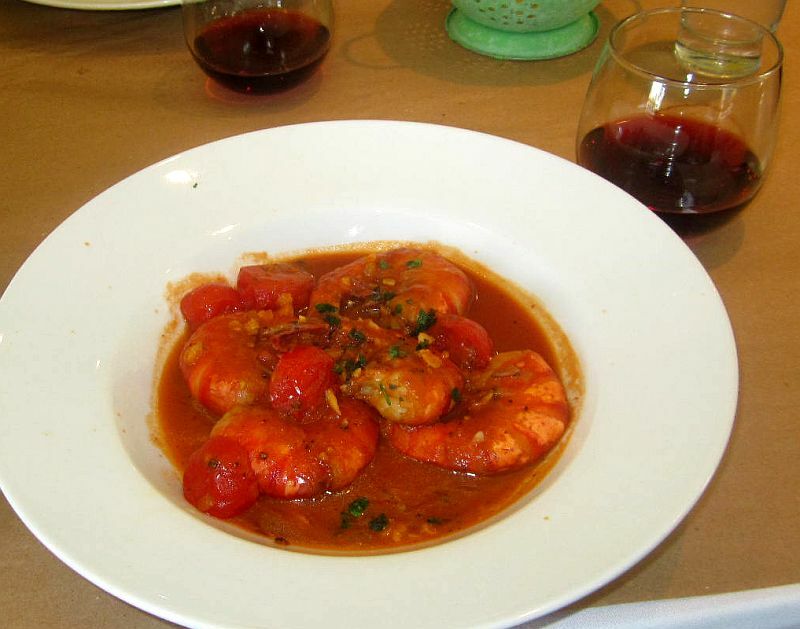 Sauteed jumbo shrimp with anise, fresh tomato and basil. You might not find a better plate of scampi anywhere in New Mexico. Most scampi preparations consist of shrimp lightly sautéed in garlic butter with a few simple herbs. Maxime’s new menu item breaks away from that mold. This plate had four jumbo shrimp sautéed in a tomato garlic anise and basil sauce. They are cooked and served with the shells on , a style that enhances the rich flavor. Fabulous. Maxime has another winner here. This Saturday/Sunday brunch dish is as good as it gets. Everything here is farm fresh and local. The Hollandaise has a touch of ground Red Chile. 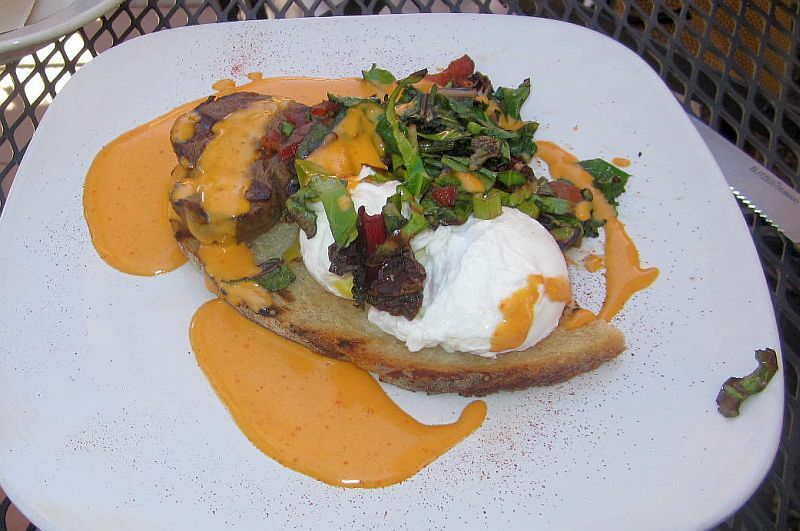 The farm-fresh eggs are poached perfectly. The bacon is just-right crispy. The tenderloin is very tender and tasty and was cooked to a perfect medium rare. Chicken, green chile, celery, topped with tortilla strips. 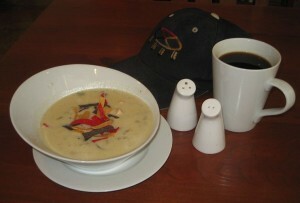 This soup is among the best of its variety to be found in the Duke City. Smooth and creamy texture, loaded with large-dice chicken breast, and subtly laced with finely diced roasted green chiles (no seeds!). The blend works beautifully, the piquancy is just right, and the appearance is lovely to behold. I would go to this museum cafe just for a bowl of this gem. Michael’s carne supplier (Gary West of Rio Rancho’s Smokehouse, now closed) has moved to Hawaii. Undaunted, Michael now makes his own, slow and long. 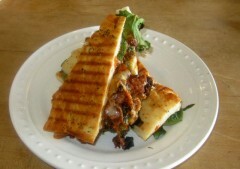 The carne, greens, balsamic, and fresh mozzarella are stacked between a thinly sliced focaccia (made by Davido’s Pizza) and expertly grilled on the press. This is likely the best sandwich I have had in the Duke City. A perfect blend of the freshest ingredients, the first bite elicited an OMG. My companion, Deanell, had the same reaction. This sandwich deserves a brilliancy prize. A molcajete (Mexican Spanish, from Nahuatl mulcazitl) is a stone tool, the traditional Mexican version of the mortar and pestle tool, similar to the South American batan (stone) used for grinding various food products. Molcajetes are also used as serving dishes in restaurants and homes. While recipes are usually not stewed or otherwise cooked in them, the molcajete stays hot for an extremely long time, and it is not unusual for a dish to still be bubbling a half hour after serving. 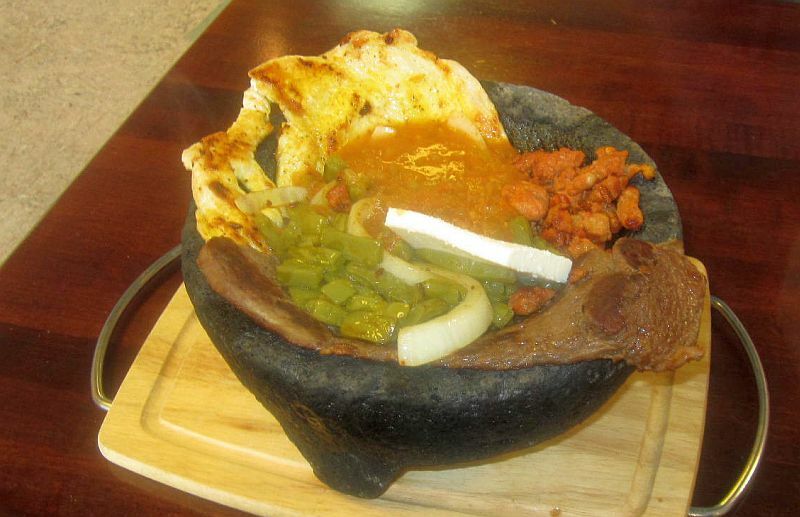 Molcajete Lupe consists of beef slices, chicken, pork, queso fresco, and prickly pear pads served bubbling hot. Beautiful. I often cook pork tenderloins at home, and yeah, I can smoke them. But not like Frans. This dish is brought to the table under a tight-fitting clear plastic dome. When Dolores removed the dome, the smoky vapors set this plate apart from anything like it. Aromas are an essential component of any dish, and this one was a winner from the very start. The pork was tender, juicy, and just past the juicy pink stage. Perfect. And then, as usual, there were the vegetables. Brussels sprouts done the way I do them at home (I pan-roast them halved with a hint of garlic) and medallions of sweet potato completed the dish. What an amazing blend of tastes and aromas. Jane and I stayed at Tamaya for three nights celebrating our thirty-sixth Wedding Anniversary. Both Santa Ana Cafe and Corn Maiden prepared spectacular desserts (complimentary).